It was good but it didn't grab me like I thought it would. Same. I like it, but it didn't wow me. I'm a little confused and that may be why it didn't grab me. I either missed, or I didn't pick up if it wasn't explicitly stated, exactly what's going on. I was a little distracted in the beginning and I may have missed some crucial parts. It was poorly explained. Hopkins character released an unscheduled update to the hosts that causes some of them start misbehaving. The other guy took the blame for it or tried to hide who did it. I think you're right. It seemed like a very confused beginning. None of the characters really made any impact, including The Man In Black, who had far to much dialogue. Is this like the beginning of Total Recall where people pay to go on a virtual trip or is this more like Eternal Sunshine on the Spotless Mind where people are trying to forget? I'm confused about that. Or is it a social experiment? Ok, Wikipedia to the rescue. The security fella summed it up perfectly, "All kids rebel." Evan Rachel Wood knocked it out the park and Ed Harris always does those menacing characters well. Am hoping Hopkins roll increases as the show moves along. It's theme park where they are testing robotics and AI. i enjoyed the show, i think its one of those shows u need to watch a few episodes to fully understand. I remember the original movie well, so I already had a solid idea of the premise. I'm interesting to see what Ed Harris's character is planning, as well as the ulterior motives of the parent corporation. This show reminds me too much of Lost. Only the last 10 seconds of each episode are interesting. As far as HBO shows go this one is fine but it's lacking something that I can't put my finger on. I guess maybe it's the subject matter isn't the normal type of thing for HBO or there's some kind of depth missing in some way? I'm going to keep watching it for sure though, as it's still one of the better shows currently on. Really liking this show so far. I remember seeing the Westworld movie when I was a kid, and something about the cowboys being robots made me feel uneasy. It seemed creepy. I did not know until recently that author Michael Chrichton actually directed that movie. Makes sense. What is it with that guy and theme parks? I have been HOPING that it does not turn into Lost. That is, have no real direction that moves the plot forward or wrap up one plot thread, adding 2 new ones in the process. I liked Lost, but I will not torture myself again through that many episodes, only for it all to be in the end, exactly what it looked like in the first episode. Finally, after this week's episode of Westworld, I don't think this is the case. There is a clear directive in the narration now. They just wanted to keep you in the dark about a lot of things, just as some of the characters are/were not aware... Oh darn, now that sounds like Lost. Oh well. I'll keep watching until I feel like they are intentionally dragging things out. Yeah this week's episode finally moved the plot along tremendously. This was the first episode of the season that I actually re-watched in its entirety. I'm late getting in to this show, partly because of mixed or confused reviews. I just randomly caught a few episodes mid season regarding Bernard's real history. It looks like HBO will marathon WestWorld on Sunday so I hope to catch it from the beginning or DVR it. The twists in the past 2 episodes have truly altered the show. You now realize you have absolutely no idea where this show is going to end up. This show can easily earn a complete 2nd run-through to look for clues revealed as well as get a better grip on everything. I love the fact that it is this complex and my wife and I each have different takes on what is going on which makes things all the more interesting. I'm waiting for the season to finish so as I can marathon it, but my friends have literally fought over their interpretation of the show, so I'm intrigued. Loving it so far. This show keeps you on your toes. It is a slow burn at times, but it's like a boxer that lulls you to sleep with jabs so the big punch catches you off guard. I set my DVR to grab all of them including the Season Finale. Don't forget to watch after the credits tonight. Wow. Last 2 episodes turned this series upside down. I really enjoyed but now want to do a second run marathon style to try to fill in many missing pieces and add clarity. i think I get the overall theme of machine/human consciousness. Watched the 90 min season finale last night on-demand (X1) because it looks a lot better than Comcast's HBO broadcast, for some reason. While there were a few things they might have left open, (I might take that back if I re-watched) they actually made sense of almost every plot-thread that had everybody so confused early on. I had a really good idea what was going on with the man in black a few episodes ago, which meant of course, this is a different timeline... Then you realize there are two completely different host awakenings, over quite a big time gap... Maeve inevitably must be Delores 2.0, and so on. It all really makes sense, and not a much like "Lost", but more like "Pulp Fiction"! You only are confused because the timeline is out of sync in the narrative. In fact, if someone edited this show in chronological order (and I'm sure someone will), I would bet that it would be pretty slow moving and probably not very confusing at all. I don't want to say boring, but probably tedious. I may have known some key points of what was going on by the finale, but I thought it was still very well put together, and was highly enjoyable. I probably won't watch the whole season over, but I may watch some early episodes over, since they will be seen in a totally different light. One cool thing is that the first season completely stands on its own, as an entire story. I'm glad that they did that. I heard that season 2 only got picked up a few weeks ago, so it makes sense to have a contained story for at least the first season, even if they left the obvious setups for beyond that. Thank you! If I hadn't seen that yesterday, I probably would have have stopped at the credits, since I watched on-demand. There were some interesting things going on there. Is it out of chronological order? Seemed to me as though everything happened as it did, the only exception would be the man in black story, and even the ending to that story should have been evident very early on to those paying attention. I enjoyed the show though. Have seen a lot of people putting it down but I found it interesting and didn't get bored once. The casting was perfect. The performances were all on point. The constant wavering of evil and good for both sides was clever in the greater context of the story. I could easily and gladly binge watch the entire series again....and am looking forward to seeing season 2. As far as I could tell, is in chronological order. It's just that they purposely leave you in the dark to the fact that there are 3 separate timelines, which is of course the key to understanding exactly what's unfolding right in front of your face, since the first episode. You could call this the main spoiler, imo. Finally finished it last night. Very unusual, but I really enjoyed this a lot more than I thought I would. One thought I have on this is it seemed like while WestWorld was populated by robots trying to evolve to consciousness, the Park invited humans to Devolve there; a prime example being the Man in Black. I do think MiB always had a darker side, but his personality was balanced with a noble side and over time that was cast off. I almost wonder if that is why he was intuitively drawn toward the Maze puzzle. He came to WestWorld and lost his humanity and in a way violently seeking towards the deeper meaning of the maze to become whole again like he used to be. Now I'm really going out on a limb with speculation here, but while MiB was shot, I don't think we saw him die. I really wonder if he could surprise us and step on a path of redemption. Maybe what he needed was someone to break him or be able to stand up to him. Or worse for him, Maeve and the robots break MiB completely mentally and physically as payback doing to him what he had done to the robots; then with Delos Tech and Felix's help, rebuild him to serve their cause like a cyborg making Ed Harris' character into a new iteration of Yul Brynner character? I think this could be a fascinating deep theme of robots striving toward humanity while in a way humans can choose to become machines and each side is crossing paths. Okay final thought, why did we see a room of Samurai Warriors being tested and trained? I think we are being teased for the complete overhaul of the park and Westworld is done. The park will be broken up into multiple other historic times as was done in the original sequel. 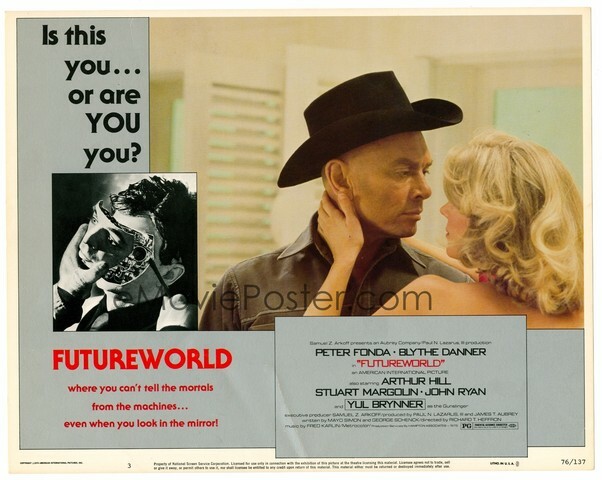 I'm wondering if Season 2 will actually be FUTUREWORLD. So it would appear this is all about purging and liberation. I can't really remember how it ended, so I'm gonna have to re-watch some of the season before season 2 starts. Is it a weekly show, or is it all at once? I can't stand having to wait each week. GoT is killing me. It was weekly, and that is how the next season will probably play out. It ended in a massacre.